Bunting, E., & Diaz, D. (1994). Smoky night. San Diego: Harcourt Brace. A connection i have noticed between this book and another is the book Wonder. So far from what i have read,wonder is story about a boy that is constantly being judge by his appearance. 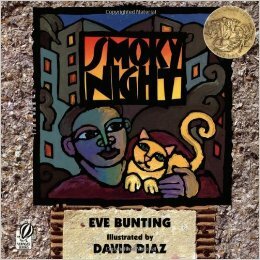 In the begin of Smoky Night, the mom judges the store clerk by here race, which people can tell because of her appearance. At the end of the story the mom realizes they haven’t given the store clerk a chance to get to know her, just like the other kids never give august a chance. I really enjoyed the creative way the author used the cats to teach the community that even though they may not like each other at first, by being in a dangerous situation together allows for people to work together and can come closer. This book is a great story for all ages and has a powerful message. My only critique is the illustration. The abstract style is very nice, but i feet abstract images take away a lot of emotion away in art. Using realistic drawing would have allowed the author to show stronger emotion in the faces of the town people. Students will experience discrimination and develop a sense of fairness and equity. Students will apply literature to real life experiences. Students will become empowered to take responsibility for their environment. Take students out in the hall and mark off an area about 40 feet long with sections ranging from 1 to 10. Has anyone every judge someone by their appearance? who? how was he or she not what you though? Great job on this blog. The connection you made between the two books is an excellent approach for students to make connections from the books they will read in the classroom. Can you make a connection with your life experiences and the books? Nice job on providing ideas to use with the book.